Once you enter the workforce in earnest, it doesn't take long before you begin toying with the idea of retiring early. The trouble is, the easiest way to quit working and live comfortably before you hit your '60s is to make a ton of money fast, which would be great if it were actually, ya know, realistic. But what if you were just really good at saving on a modest salary? Could you make it happen? 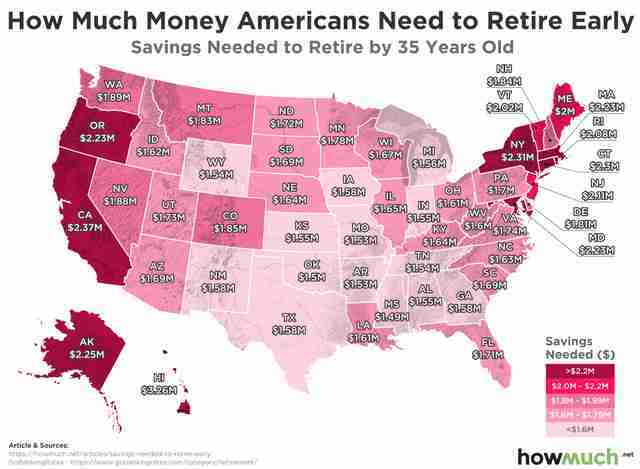 Well, this new map should give you an idea, since it lays out how much money you should save to comfortably retire in every state by age 35, 45, or 55. To help you wrap your head around how much you'll want to have in the bank before pulling the plug on the nine-to-five life, the folks at HowMuch crunched the numbers on the annual cost of living around the country to figure out how big your nest egg should be in every state if you want to quit working by three different theoretical retirement ages: 35, 45, and 55. Specifically, they adjusted the cost of living on a state-by-state basis using data from the Bureau of Labor Statistics and then divided those by .04 (assuming that's the rate at which each person would draw down their savings each year). As it turns out, you'll need at least $1.4 million saved if you want to retire anywhere by age 55. 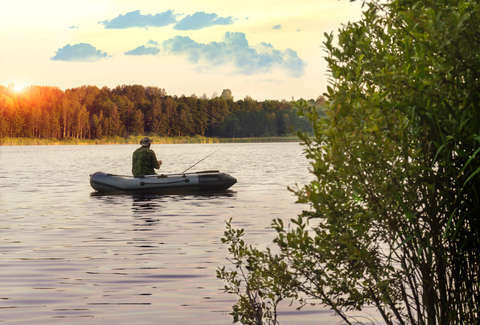 That said, Mississippi is the most affordable place to retire young, where $1.49 million in savings by 35 will set you up comfortably. On the flip side, to retire by 35 in Hawaii -- the most expensive state to do so -- you'll need a whopping $3.26 million stashed away. You can scope out the details for all three prospective ages at HowMuch, but here's how much you'll need to save in each state to retire by age 35. As the HowMuch team points out, it's worth noting that these figures are simply an estimate, and were determined using some fairly crude data and calculations that don't factor in a change in living expenditures or inflation (which, if you're hoping to retire by 35, will very likely change in the 50-plus years you can expect to live after that). This is also assuming you'd only be withdrawing a set sum every year. However, as untenable as it may seem to have $1.4 million or more in the bank by age 35, it's still nice to know what you should be striving for. Then again, there are plenty of beautiful places around the world where you can probably afford to live on much, much less.